Yay for Wednesday in a four day week! It feels like Tuesday, but thankfully it's Thursday tomorrow. Speaking of the working week, I can't remember what I was reading (maybe it was a magazine at the hairdressers today) and it was that recent author whose whole book is about being 30 and how horrid everything is, especially in the workforce and how depressed everyone is at 30 and how she wanted to escape the pinstripe suit set around town. Blah blah blah, so predictable and negative! Golly, no one I know is super depressed about turning any age, and the only thing I felt (and a handful of friends) about turning 30 was a little nostalgia about old friends, and so we hooked up here and there. As for escaping the pinstripe suit set... WTF? I have never thought a job defines the clothes. Some aspects of my career has changed over the years (I used to wear more trousers when I was walking in paddocks and now I wear more dresses since I work in an office) but I find a whole book about 'thrisis' (the crisis of turning 30 according to this author) totally annoying! And so today's pinstripes are brought to you by ME, for WWW - Watcha Wearing Wednesday, and it's my interpretation of what you CAN wear at the office. I know not all workplaces are the same, but I'm happy with my job and that I can wear whatevs I like! My dress was $8 from a fabulous second hand store nearby my house, and the shoes are oldies from Target and I think they may have been $25. Wow, expensive! It's funny thinking of my old purchasing days - I bet I thought $25 was cheap before I stopped buying new things! It was really sunny today, so it was hard getting a photo in my backyard. But I still love Meg's photos as the layout makes any bad pics cute! After work I went to the hairdressers (just an update on the platinum) and then finished my friend's shirts (bar the buttons). I'll finish them off properly tomorrow as I wanted to get cracking on a puppy bed for our little Doggie. She arrives on Friday and I'm almost finished. It's a bit weird, and I broke 1 needle cause the material is so thick (any clues on sewing corduroy type material to wadding?) but I bet it'll look FABULOUS once it's done. I even drew a diagram sketch so I wouldn't get confused! I'm so with you with the 'oh, my life is over now I am 30' thing... why are people so miserable?!! When I passed thirty it was a breeze. I'm ready for it, show me what you're made of thirties! The big day for me in next year, but I feel if I say anything about it my Dad, who turns 60 a few months before will say Anna, grow up and try 60 on for size. Congrats on the new puppylove! Your dress is absolutely beautiful - great colour! my only advice with the sewing is to widen your stitch length to maybe 3.5 that might help. Very true... people tend to overreact... very cute dress! Love the color and it's perfect for Spring. 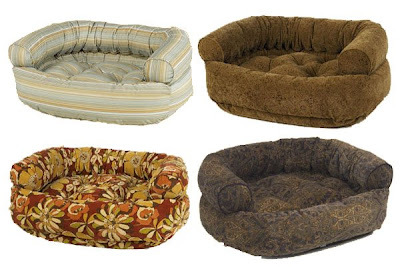 Those doggie beds look so awesome.